Lucky Reptile Coco Backgrounds are 100% natural backgrounds made from coco fibres. They are free of chemicals, pesticides and fertilizers. Natural rubber is used as glue which is completely safe for the animals. The material can be cut easily and can be quickly adapted to any terrarium size. 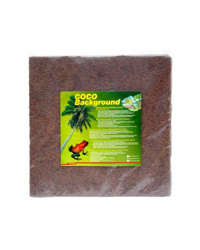 Coco Backgrounds are also an excellent subsoil for plants. Tillandsias, vines and tendril plants can be planted on the background and quickly adhere to the coco fibres. With Lucky Reptile Coco Backgrounds you can easily create an highly attractive tropical terrarium.